A wirecut machine and a dough mixer which combine maximum flexibility with minimal production costs were the highlights of Baker Perkins’ exhibits for the biscuit industry at Interpack (Hall 4 stand C21). The latest Baker Perkins TruClean™ wirecut machine for soft dough cookies, plus plain and filled bars, was at Interpack for the first time. 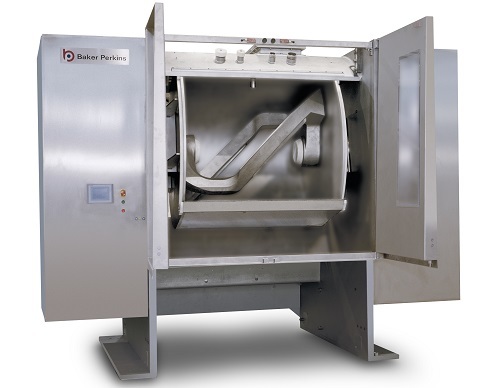 The result of radical innovation in Baker Perkins’ approach to hygienic design, every aspect of this machine has been reworked to offer more thorough cleaning, more quickly, with easy maintenance. There is the option for customers to select one of two hygiene levels, according to their own cleaning regime and cross-contamination risk. Exceptional reliability, fast changeovers, low waste and minimal giveaway enable high production rates to be maintained while keeping operating costs low. This new design uses the well-proven Baker Perkins filler block and die technology to offer outstanding weight control of +/- 1-2% on plain dough. Food service manufacturers in Europe have invested recently in frozen dough wirecut machines from Baker Perkins, the leading supplier of equipment in North America where soft dough cookies baked at the point of sale are available in a multitude of retail outlets. The full Baker Perkins range, meeting output needs from craft to plant-scale bakeries, is now being introduced around the world, coinciding with the development of an innovative concept offering superior levels of performance, choice and hygiene. The new concept is based around a Baker Perkins TruClean™ wirecut with a series of standard modules for topping and paper handling. The HS (High-Speed) range of multi-purpose mixers handles every type of biscuit, cookie and cracker dough. It features a unique, shaftless mixer blade ensuring efficient dispersion and rapid dough development, cleaner discharge, the elimination of blade fatigue and cracking, and improved hygiene. The absence of a shaft, and the curved profile of the double-arm blade, ensures that rapid dispersion of ingredients is followed by thorough and efficient mixing as dough circulates freely around the bowl. Delicate inclusions are incorporated evenly without damage or smearing. Loading and discharge are fully automatic to reduce labour costs and mix cycle times. Full discharge is achieved without manual intervention by a bowl tilt of 150°, and because there is no shaft to obstruct the dough. As well as better mixing and automatic discharge, the shaftless design has a number of other advantages over traditional mixers using blades with shafts. Because a centre shaft rotates slowly, ingredients and partially mixed dough that adhere to it are not dislodged, and have to be removed manually. In addition, welded shaft and blade assemblies are prone to fatigue and cracking; also, the shaft tends to flex, creating seal wear and leakage from the bearings. A new option allows the mixer to tilt backwards so that minor ingredients can be added from behind when required by the plant layout – typically when discharge is to a power dough feeder that restricts access to the front of the mixer. Another version tilts further to allow rear discharge of reject dough. Baker Perkins HS mixers with a shaftless blade are at work handling every kind of dough for cookies and crackers around the world.